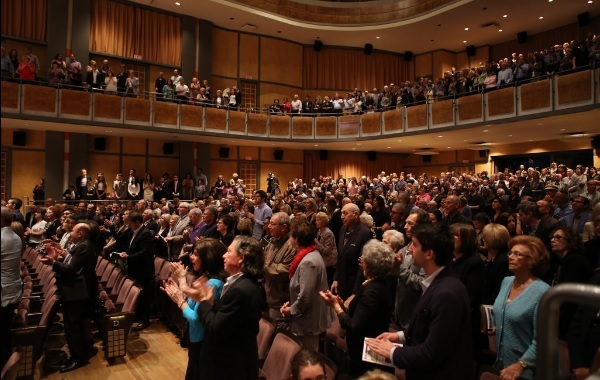 Almost 1,000 people filled the George Weston Recital Hall at the Toronto Centre for the Arts for a “Celebration of Life” concert June 4. The evening, a fundraiser for Beit Halochem Canada, Aid to Disabled Veterans of Israel, featured performances by Israeli singers Orit Shalom and Alon Shaar, as well as musicians Stav Nachum and Tamir Leibovich, interspersed with stories of wounded Israeli soldiers affiliated with the organization. Beit Halochem provides rehabilitation services to 51,000 disabled veterans and victims of terror through its five – soon to be six – centres in Israel. The Canadian organization was established 37 years ago. The annual concert honoured four designated “heroes” of the evening who were wounded in last year’s Operation Protective Edge, and who appeared in videos as well as in person to standing ovations. In Toronto, the concert’s last stop after Calgary and Montreal, Toby Feldberg, president of the Canadian organization, also welcomed 10 disabled Israeli war veterans who were in town as part of a two-week trip sponsored annually by the organization. The group’s leader, a Druze, was a brigade general in a combat unit. Montreal – and Vancouver and Calgary together – also host trips. Guest speaker Elyezer Shkedy, former commander-in-chief of the Israeli Air Force and former president and CEO of El Al, brought a message of optimism to concert-goers. “We are part of the biggest miracle in the history of the Jewish nation,” Shkedy said, citing Israel’s expertise in technology, medicine and culture. He added that wounded soldiers have “sacrificed a lot” for the survival of the country. “We have to do all we can do to let them continue their lives in the way that they deserve.” Shkedy concluded by expressing his “deep hope” for a world free of conflict. Sariel Teper didn’t realize he’d been wounded by shrapnel when he saved a fellow soldier’s life by stemming the flow of blood from a neck artery with his finger, until medical help arrived 20 minutes later. “I’m sure he would have done the same for me,” he said. In an emotional speech, his wife thanked attendees for their support and family-like embrace. Hamilton, Niagara Falls, Ottawa, and Kingston were part of the itinerary, too. The program last week included visits to Jewish day schools to talk to students, as well as synagogue visits, horseback riding and sailing, and a day at Camp Wahanowin, which has been hosting them for several years. At the camp, they can take part in activities such zip lining, rock climbing, archery, and canoeing. “It’s an opportunity to stretch their limits, and experience a Canadian camp day and the beauty of our country,” Levy said.